Existing CS customers save 40% when they upgrade to the cloud. Receive a 1-month free trial of Creative Cloud. Valid for home/office customers only. Looking for the tools to make incredible digital creations that stand out? Get great deals on the top design software, graphic tools, and mobile applications on the market at Adobe.com. Design your own price with an Adobe coupon to place your order today and save big on industry-leading software. Adobe UK is the leading graphic tools software. Adobe UK software gives you the capability to make beautiful digital creations. Make your projects look professional without burning a hole in your wallet. Below are instructions on how to use and apply an Adobe UK discount. 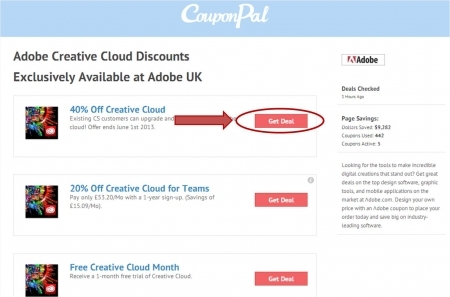 After locating the coupon or deal you want to use to purchase Adobe UK Creative Cloud, click the corresponding "Get Deal" button on the Couponpal Website. A new window will pop open when you click on your button. If Couponpal is providing you with an Adobe Creative Cloud discount code, copy and paste from the pop up window. Keep this window open in case you need to come back to it later. If there is no Adobe Creative Cloud discount code, you will skip this step. In the event there is no Adobe Creative Cloud discount code, your discount will automatically be applied to your purchase by clicking through the CouponPal website. Choose a Adobe Creative Cloud plan. Select for an individual or for teams. Click "Join" next to the plan you wish to purchase. If you already have an Adobe ID, use your email address and password to sign in. If you need an Adobe ID, click "Create an Adobe ID." Finally confirm everything is correct to finalize purchase. Adobe has set the bar for design and programming software, becoming a go-to for developers, digital artists, and anglophile innovators alike. Adobe offers the cutting edge development, graphics, and visually driven technology like Photoshop, InDesign, Illustrator, Dreamweaver, After Effects, Premier Pro, Shockwave Flash, and Creative Cloud – in a format compatible for those across the pond. With Adobe UK, the design and digital possibilities are endless. Create stunning, high impact websites, graphics, ezines, animation, illustration, webisodes, music, movies, and more by choosing from hundreds of Adobe products and suites. Adobe even also offers courses and certifications online in a variety of programs including Acrobat Pro, Connect, Framemaker, Digital Publishing, InDesign, Illustrator, Dreamweaver, Scene, and Site Catalyst. 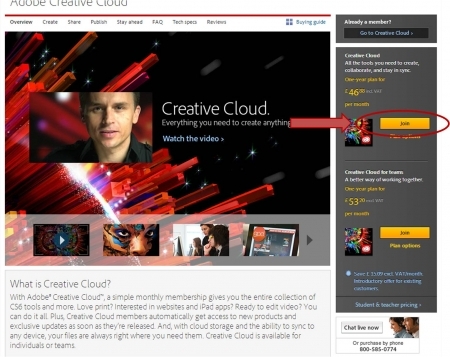 Popular site feature, Adobe TV, houses video on everything from expert tutorials to industry trends to customer stories. Last, Adobe makes learning a two-way street and provides labs, community learning, webinars, books, and offline events. Adobe has been in the business of changing the world through digital experiences for over thirty years now. Founded in 1982 by John Warnock and Charles Geschke, former Xerox employee, they became pioneers in desktop publishing after Apple Computers licensed PostScript for its LaserWriter printers. From their humble beginnings in page description and code, to the multi-billion dollar empire it is today, Adobe has maintained the lead as industry innovator in software by continuing to deliver game changing, award winning products and creating endless creative solutions and potential. Adobe puts their big dollars where their mouth is, when it comes to their philosophy to “create change.” They’ve established a Corporate Social Responsibility or CSR, which develops and oversees all aspects of giving back and takes their focus off the screen. Some of their efforts include employee engagement & enrichment, community involvement, creative grants, Youth Voices, along with their Environmental Sustainability Council. Adobe helps customers create, deliver, and optimize their own businesses, services, and respective bodies of work so they can interact and compete on a global level. Use an Adobe coupon on your order today and get a price that looks as great as your next creation. Photoshop, Photoshop Extended, Photoshop Lightroom, Illustrator, InDesign, Adobe Muse, Acrobat XI Pro, Acrobat X Pro for Creative Suite, Flash Professional, Flash Builder, Dreamweaver, Edge Tools & Services, Fireworks, Adobe Premiere Pro, After Effects, Adobe Audition, SpeedGrade, Adobe Prelude, Encore, Bridge, and Media Encoder. As a Creative Cloud subscriber, for a monthly fee you get full versions of all of Adobe’s Creative Suite software. In addition, you get online collaboration tools, Cloud syncing, web hosting, loads of storage, and more. Plus, you’ll receive all the latest Adobe touch apps and all updates to their products as soon as they are released. The only thing that previously stood in my way of using more of Adobe’s products was the upfront, initial cost. I simply could only afford the absolute necessities. There really are no cheaper substitutes for Adobe: they’re the best, they’re the standard, and that’s just the way it is. But now, the whole of the design world is at my fingertips! Basically, once you sign up, you’re able to download the apps onto your computer. Stop paying and they stop working. A little like paying rent on a flat. Of course anything you created using them remains yours. The cost? This is the really good part. Whether you’ve ever owned a CS product or not, the monthly fees are incredibly reasonable. Adobe has wisely figured out (and restructured accordingly) that better affordability leads to more customers, hence the addition of this subscription model. Make sure to check the Adobe UK site for any changes, but it shapes up something like this: Commitment to an annual plan runs about £47 per month, with a month-to-month option available at around £70. Adobe is presently offering current CS customers a 40% discount on the first year of Creative Cloud membership if you own Creative Suite editions or individual products, versions CS3 or later. If you’d like to test the waters before diving in, Adobe is graciously offering a 30-day free trial of Creative Cloud. I’m guessing that they’re guessing the majority of experimenters will be hooked – give them a taste and they’ll come back for more. For myself, I am beyond pleased with my choice to subscribe and have used everything they have to offer much more than I had dreamt of, and I had dreamt of using them a lot. Plug in that Adobe promo code for extra savings and value on what you’re sure to soon regard as an invaluable investment in your creative endeavours.